State calls Officer JD Snell to stand. Ms Andrews for State begins questioning. Snell is PD for Tempe, patrol officer. Dec. 27, 2009, he was called into station for a custodial interference. Snell arrived @ 1 PM and spoke with Logan. Snell listened to EJ on telephone recording stating she had killed baby. Snell called a supervisor. Snell continues to talk with Logan. Recorder was impounded into evidence. Snell viewed Logan's phone. Saw text messages. Snell photographed them on the phone. Entered into evidence.
" PHOENIX - A missing baby's grandfather takes the stand on the third day of the Elizabeth Johnson trial. She's the Tempe mother accused in the disappearance of her son, Gabriel. Frank McQueary took the stand around 11:25 a.m. McQueary is a retired Phoenix police officer who was aware of the custody dispute between his son and Johnson. This is according to Logan McQueary, the baby's father, who testified Monday. Logan McQueary said that his father gave him a voice recorder and he used it to record all conversations between him and Johnson. Logan McQueary told jurors that Johnson said she suffocated Gabriel, stuffed him in a diaper bag, and threw him in the trash." I was able to watch Frank's testimony. IMO, he was a very credible witness, calm, thoughtful and steady in his responses; he came off as a caring grandfather and very supportive of his son, Logan. He seemed to guide Logan into getting LE and the courts to help them. I believe the prosecution also showed there was an extended family ready, willing and able to provide love and support for Baby Gabriel. It seems to me what is going on is that TS trial was "I was just a caring individual who loves children and wanted to help this poor unfortunate girl with nothing but pure unselfish motives and I just love all babies" VERSUS, EJ saying " I am just a poor unfortunate girl who was manipulated by this older lady who knows all the ropes of adoption/business matters, and I was simply overwhelmed by a little baby and lousy BF, etc.". TS got off practically scot free for custodial interference, so EJ is betting on a similar outcome if she says little to nothing. Her defense team is barely questioning anything. And in the end, we still have a missing....."missing" baby. And a father robbed of his child. IMO. Amen sister, Weezie. Wretched women. Baby killer and baby snatcher. This case got lost in the Casey Anthony furor and never got the attention it deserved and in the meantime the little guy is still missing and the angelic face of the prima dona narcisstic mother masks another eraser killer. And the sun baked judge is too lackadaisical to mete out justice or keep regular court hours. I know, Ishi. It's maddening and heartbreaking all at the same time. Court is in session. First witness was neighbor in trailer park. Testified to seeing police 2x looking for Gabriel, and one phone call to EJ from "a lady" that came in on her phone. Assuming it was TS. EJ in a solid light blue button down shirt, no earrings. EDIT: Forgot to mention that the Judge said things were moving along and trial would conclude sooner than they initially thought, but he did not clarify when. He said by multiple days and he would inform the jury as he knew more. Lunch Break until 1:30 pm MST. Currently a computer forensic scientist is testifying about data gotten from EJ's GPS. Locations plotted in San Antonio, Nashville, and Florida. He is in the middle of testifying when lunch break was announced. Back from lunch break. Judge said trial would end Oct 22 rather than Nov 6 as previously thought, however, no testimony at all week of Oct 8th. Forensic guy still on stand; now talking about digital camera. They found 66 photos between Dec 20-26, 2009. He's describing the images now. Finished, but the jury actually has some questions. Re GPS device. Clarified that it is not the kind that tracks movements, merely acts as a mapquest type of device to look up locations. They also asked if he can tell who used it, and when it was used. Answer = no. FWIW, our little defendant did not bat an eye and looked incredibly bored when they showed (up on a large screen) approx 8-10 photos of baby Gabriel that were taken off the camera. Jury - I hope you noticed. She did look bored. Later when the Santa Clause pics were shown she batted her eyes a few times to appear to be holding back tears....a no go on that one too. PHOENIX - The trial continues for the mother of a missing baby who vanished nearly three years ago. Elizabeth Johnson kept her composure in court Wednesday, just one day after she broke out in sobs during testimony. The trial is going by fast and Johnson's attorney rarely cross examines any of the witnesses. It was supposed to go until the end of November, but now it could end October 22. In court, detectives testified that the last picture Johnson took of her son Gabriel before he disappeared was taken Dec. 26, 2009 at 7:48 a.m. Johnson also got to see the picture of her son on a computer screen in front of her. Tempe Police detective Todd Bailey, analyzed Johnson's GPS unit, her digital camera, her cell phone -- trying to figure out where Gabriel is. Short trial day today. One witness. A detective who went through all of the phone and text message records of EJ, Logan, TS, and JS. Tedious testimony. Defense did short cross x..
Next week trial on Monday, Tuesday and Thursday. Following week of Oct 8th dark. Picks up the 3rd week in October. PHOENIX - The trial of baby Gabriel's mother is in recess until Monday. Thursday, a Tempe police detective testified about Elizabeth Johnson's cell phone activity. The jury saw text messages Elizabeth Johnson sent when she was on the run. Her attorney said there's no real surprises -- no smoking gun. He said the trial is going exactly how he expected it to go. "Thank you judge we have no questions." "No questions for this witness." It's rare for Elizabeth Johnson's attorney Marc Victor to cross-examine witnesses called to the stand. If he does, he asks few questions. Victor is not only a defense attorney. Turns out he's running for senate as a libertarian. This is from the first page of the thread. Note the date was in 2010. I have clipped some of the article to direct attention to a statement I find of interest. "What she is telling us is that she met a family, a Caucasian man and woman with no child -- young," Tammi Smith told "Good Morning America." "And she met them in the park. And she was crying and distraught and they came up to her and said, 'How can we help you?'" When pressed for details about the couple, Smith said Johnson didn't remember much despite having spent three days with them, just that the woman's first name was "Cheryl." Tammi Smith said Johnson told her she purposely tried not to focus on their car or last names so she wouldn't be tempted to change her mind and get her son back. "She believed she was doing a closed adoption," Tammi Smith said. In a jailhouse interview Tuesday with a Phoenix CBS affiliate, Johnson reiterated her claim that she had given Gabriel to a couple she met at a San Antonio Park. "I made a hasty decision and I thought it was OK," she said. "They approached me. I was out alone with the baby at the park. I trusted them, I believe in my heart they are good people." Johnson is scheduled to be extradited to Arizona this week. Police have also questioned the Smiths and searched their home but found no clues to indicate where Gabriel might be. Authorities have said witnesses last saw the child in San Antonio. The FBI found Johnson's car in a San Antonio motel parking lot Tuesday night. According to ABC affiliate KNXV, investigators were combing the car for evidence but said there were no obvious signs of violence. McQueary, 25, said his fears for his son's life stem from a series of text messages he received from Johnson. "She basically said, 'There is no way in hell you will see your son again,'" he said at a recent news conference. "She put in the text, 'I killed him." Johnson has been interviewed at length by investigators but police said she refuses to tell them what happened to her child. "She was confronted, arrested and interviewed exhaustively about the whereabouts of the child," Miami Beach Police Sgt. Wayne Jones said. "All we know at this point is Gabriel can be anywhere between San Antonio and Miami Beach." Not that I believe much of what EJ has said but it is limited info to work with. Presuming EJ did give up the baby (and I am following that lead only because it offers a slim ray of hope), EJ was apprehended in San Antonio, she said the baby was given to a couple in a park in San Antonio, she has given some name to authorities, she has given a vague description of the couple, LE know the approximate date of the child's disappearance. Did TS arrange for this couple to meet with EJ? Let's be done with the games. Child endangerment should have been at the top of the list of charges. People do NOT give their children away to strangers. (What is happening in America is a break down of rules, laws, traditions. The trial for Elizabeth Johnson, the mother of missing baby Gabriel Johnson, resumes today after a brief recess last week. PHOENIX (CBS5) - The trial for the mother of missing baby Gabriel Johnson will begin again Monday after a brief recess last week. Gabriel Johnson has been missing for nearly three years. He was last seen as his mother fled the state with him to Texas but shortly after that, Gabriel Johnson disappeared. Did anyone see the video of Elizabeth Johnson's (last Tusday) outburst? PHOENIX - Prosecutors used baby Gabriel's mother's own words against her during trial on Monday. Elizabeth Johnson started crying as the jury saw emails between her and Gabriel’s father, Logan McQueary. The emails show McQueary wrote Johnson that he loved his son and wanted to be apart of his life, but he said Johnson kept pushing him away. Testimony began today 1/2 hour late - which is good for this trial! Several witnesses on the stand...mainly detectives and FBI from Miami area talking about the time frame of Dec 20-27, 2009. For those of you familiar with the Tammi Smith trial, Detective Patricia Ramirez took the stand before lunch and is continuing now. Interesting thing to note is that EJ has left the courtroom - she told the Judge she did not want to hear anymore of Det Ramirez testimony and esp an audio tape which was coming up. Apparently she was concerned over how she would react. This is within her right to leave apparently, and she did so. The jury will now listen to a 25 minute confrontational phone call (investigative tool) made by detectives between EJ and TS on January 22, 2010 - this was also an exhibit in the TS trial. Just wanted to bring everyone up to date so far. Also - there will be a 2 week delay in the trial after this week's testimony bringing closing arguments beginning Oct 16th. Weeziethm - thanks for the update, with EJ leaving the courtroom as to not hear the confrontational phone call, I wonder what the jury thought of her behavior? I liked Det. Ramerez from TS's trial, imo, she did a good job of trying to illicit information from 2 dishonest women, still, where is baby Gabriel? I have lightly looked for the emails reported in this case and have not seen any of them. Does anyone have access to them or a link? I would like to read them. art tart wrote: Weeziethm - thanks for the update, with EJ leaving the courtroom as to not hear the confrontational phone call, I wonder what the jury thought of her behavior? I liked Det. Ramerez from TS's trial, imo, she did a good job of trying to illicit information from 2 dishonest women, still, where is baby Gabriel? Art - the jury was not in the room when the attorneys, Judge and EJ were there discussing her departure...in fact, the Judge said that he would also be out of the room when the jury came back in to avoid the interpretation that EJ had "stormed" out. He then read a statement saying that they were not to "read anything into" the fact that the defendant was not in the courtroom for the afternoon testimony. One interesting thing about Det Ramirez is that she has been seated at the Prosection Table the entire trial. I'm not sure why. And I thought witnesses could not be in attendance until after their testimony was concluded. Anyone? But you are right, Art Tart....WHERE is Baby Gabriel. It is clear that absolutely everyone from LE, FBI, Detectives, McQueary's, attorney's all want desperately to get an answer to that.....everyone EXCEPT for EJ. Freckles wrote: I have lightly looked for the emails reported in this case and have not seen any of them. Does anyone have access to them or a link? I would like to read them. Hi Freckles. I am not a member so I cannot access, but Websleuths is following this case pretty closely, and I know they have a complete thread devoted to Gabriel. You may find something there. Weeziethm - you are correct, usually witnesses are kept outside the Courtroom UNTIL they testify. I guess it might depend on the Defense or Proseutor's obections to a witness sitting through trial. I was furious in KC's case the Prosecutor's didn't object to the ANT's sitting through the entire case, I guess they just figured they would have watched it at home on IN Session and it could be they thought Cindy was going to be more honest than the consistant liar she had been through the entire case. I've never seen a witness for the Prosecution sit at the Prosecutor's table, LOL, there's usually not enough room. PHOENIX, Oct. 3 (UPI) -- Arizona jurors heard the chilling recording wherein Elizabeth Johnson coldly admits smothering her baby Gabriel during a custody dispute with the boy's father. "Gabriel's in the Dumpster," Johnson is overheard. "You want to talk to girls, that's the price you pay. ... I wasn't going to let you take him from me,"
"You did not hurt Gabriel," the boy's father, Logan McQueary, responds. "Yes I did," Johnson replies. "I suffocated him. I covered him up with a towel, and I suffocated him, and he turned blue, and I put him in his diaper bag, and I put him in the trash can." PHOENIX (CBS5) - The state has rested its case in the trail against the mother of missing baby Gabriel. Elizabeth Johnson asked not to be in court during testimony on Tuesday as the prosecution played a recording of her phone call with Gabriel's father, Logan McQueary in which she tells him she's killed their son. PHOENIX -- Prosecutors have finished presenting their case in the trial of an Arizona woman whose baby went missing after she fled to Texas in 2009. Jurors hearing Elizabeth Johnson's case have two weeks off before the defense begins on Oct. 16. KTVK-TV reported defense attorney Marc Victor has said he may call Johnson to the stand. Prosecutors wrapped up their case Tuesday by playing a recording of Johnson telling baby Gabriel Johnson's father that she had killed the boy and put him in a trash bin in San Antonio. Am I correct in believing that the only reason Elizabeth J wasn't charged with murder is because she was charged in a diff state to the one where baby Gabriel disappeared and therefore could only be held accountable for lesser crimes. Gia wrote: Am I correct in believing that the only reason Elizabeth J wasn't charged with murder is because she was charged in a diff state to the one where baby Gabriel disappeared and therefore could only be held accountable for lesser crimes. I believe it is because "whatever happened" to Baby Gabriel occurred in the state of Texas, and AZ cannot bring homicide charges against EJ since "whatever happened" happened in another state. IIRC, AZ brought the custodial interference and kidnapping charges because EJ broke that state's court orders (ie, Logan full custody, etc). The attorney for Elizabeth Johnson has filed a motion to dismiss a kidnapping charge against the mother of missing baby Gabriel Johnson. Marc Victor said in a motion filed Friday morning that Arizona does not have the jurisdiction to prosecute Elizabeth Johnson for kidnapping. The motion comes four days before the defense was to present its case in Johnson's kidnapping trial in Maricopa County Superior Court. PHOENIX - As her trial wraps up, Elizabeth Johnson, the mother of Baby Gabriel, will not testify in her defense and closing arguments will begin Tuesday according to her attorney. ABC15 learned Marc Victor filed several last minute motions he hopes will get his client out of jail soon. In court documents filed Friday, Victor asked Johnson’s trial judge to toss out the kidnapping charges against Johnson. Going out on a limb here but.... Custodial interference began in the state of AZ; Kidnapping the child, a harder charge to prove IMO, also commenced in AZ. EJ was in the state of AZ when she refused to honor the AZ' court orders to share custody, to turn her child over for visitation with the father; she fled from AZ. Gabriel was a resident of AZ at the time and so the AZ courts would have jurisdiction over the shared custody. If that matters. EJ is not being charged with murder of the child at this time. EJ is not being charged with a wrongful sale or adopting out of her child at this time. That would be a mess to try to determine which state would have rights but IMO it would probably go to IF the child was found and which state he was in at that time. Edited: EJ fled WITH the intent of disobeying AZ court orders. IMO, EJ was NOT authorized to have custody of her child during those days in which she was to have relinquished Gabriel to his father. Hence, there was custodial interference. When she fled to another state with Gabriel to defy a court order, she did kidnap her child. Yes.. absolutely. WHat in the world is this lawyer thinking anyway... trying to get the charges dropepd. Marica wrote: Yes.. absolutely. WHat in the world is this lawyer thinking anyway... trying to get the charges dropepd. Required for appeals, IMO. Standard action. The rules of courts are just too dang strange. PHOENIX - The trial of an Arizona woman charged with criminal wrongdoing in her child's disappearance is set to resume Tuesday. Prosecutors finished presenting their case against Elizabeth Johnson earlier this month. Defense attorneys will be given the opportunity to present evidence. I haven't followed this trial. I needed a break for awhile. What is the prevailing thought as to how the prosecution vs. the defense did? I realize the closings haven't happened yet, but for those who did follow this...how do you think it went. PHOENIX -- With the jury off Monday morning, Elizabeth Johnson's attorney, Marc Victor, made his appeal to drop the kidnapping charge against her. He argued that two factors that must be proved in a kidnapping case don't apply to the mother of missing Baby Gabriel. First, the state has to prove she restrained the baby by keeping him away from his father, Logan McQueary. Johnson's attorney used texts from Johnson saying she killed Gabriel to bolster his argument. The judge disagreed. So did the attorneys for the state, arguing they had enough to prosecute for kidnapping. "Whether she killed him or whether she gave him away to another couple, she did it without the father's consent," Elisa Ramunno said. "That was restraint within the meaning of the statute." I was able to watch a little bit of the attorney's arguments yesterday, and Marc Victor spent quite a bit of time on jury instructions. For example, wanting wording changed from the Black's Law Dictionary definitions, and filing additional supplemental instructions. Seems to me as if he is trying to win his case with the jury instructions, but the Judge doesn't seem to be buying what he's selling. I have never been impressed with this judge (ie, Tammi Smith trial), but I think he is holding fast to the law on the jury instructions. At least through the portion that I was able to watch...LOL. The trial for the mother charged with kidnapping in her son's disappearance almost three years ago is scheduled to resume at 10:30 a.m. today in Maricopa County Superior Court. Elizabeth Johnson has pleaded not guilty to charges of kidnapping, custodial interference and conspiracy in the December 2009 disappearance of baby Gabriel Johnson, who was 8 months old when he was last seen. Johnson's attorney, Marc Victor, has not scheduled any witnesses for Tuesday and is not expected to call Johnson to the stand in her own defense. Victor has maintained the state has not proven its case that Johnson's testimony is not needed. An Arizona woman charged in the disappearance of her infant son more than two years ago was consumed with anger over the demise of her romantic ties with his father and used the boy as a pawn in their disputes, a prosecutor said Tuesday in closing arguments at the woman's trial. Elizabeth Johnson ran off to another state with the child as a way to retaliate against his father, Logan McQueary, for ending their tumultuous relationship, prosecutor Angela Andrews said. "She wants to get back at Logan, and she is upset, and she uses the one thing that would hurt Logan more than anything," Andrews said. Maricopa County Superior Court Judge Joseph Kreamer denied a request by Johnson's attorney to dismiss the kidnapping charge. PHOENIX (AP) - An attorney for an Arizona woman charged in the disappearance of her baby more than two years ago told jurors they're probably angry at his client but shouldn't be swayed by their emotions. Defense attorney Marc Victor told the jury during his closing arguments Tuesday that the case is not "about whether or not you like Elizabeth Johnson." PHOENIX -- The fate of 26-year-old Valley mom Elizabeth Johnson is now in the hands of a Maricopa County jury. In a day full of courtroom drama, prosecutors and Johnson's defense attorney presented their closing arguments in the high-profile kidnapping, conspiracy and custodial interference case. 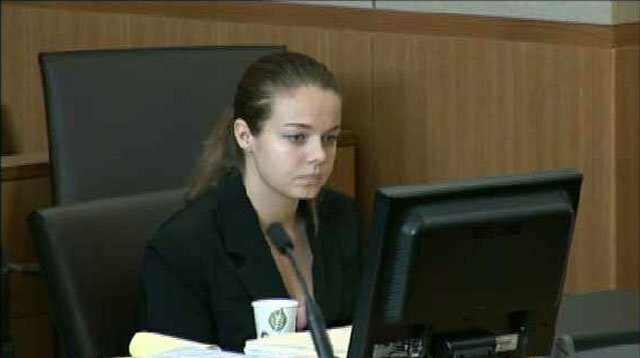 Elizabeth Johnson Trial: Jury went to lunch. They will return at 1:30pm to deliberate. Here's the latest that I could find. PHOENIX -- It's like ignoring "an 800 pound gorilla in the room." That's the way Elizabeth Johnson's defense attorney described instructions given to jurors in his client's high-profile case. In those instructions, the jurors were ordered not to concern themselves with "the current status" of missing Baby Gabriel Johnson. "Current status of Gabriel Johnson not an issue in this case," Judge Joseph Kreamer admonished jurors Tuesday afternoon before he handed them the case for deliberation. PHOENIX -- Maricopa County Superior Court recently released video to 3TV of a custody hearing between Elizabeth Johnson and Logan McQueary regarding their then 7-month-old son Gabriel. The hearing occurred December 17, 2009, just one day before Johnson allegedly fled Arizona with baby Gabriel. During the hearing, both Johnson and McQueary agreed to joint custody of Gabriel, but each complained about the other’s ability to be a good parent.